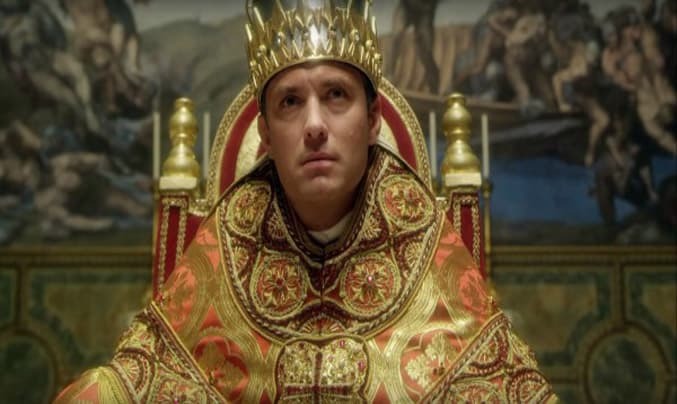 Helmed by Oscar winning Italian director Paolo Sorrentino, THE YOUNG POPE tells the fictional story of Cardinal Lenny Belardo (Jude Law) as he assumes the mantle of Pius XIII, the first American Pope in history. Young and charming, his election is the result of a media strategy on the part of the College of Cardinals who they think they can control and use the young pope to rejuvenate the masses. But appearances can be deceptive and it soon becomes clear that Pope Pius XIII is no ordinary pontiff. Conservative, rebellious and more headstrong than expected, Belardo refuses to follow the Vatican’s rules, employing Sister Mary (Diane Keaton) – the woman who looked after him as an orphan – as his closest advisor. As he tries to reshape the Vatican into his image of what a godly institution should be, the very foundations of the church are threatened. The 10 part mini-series, which is a joint Sky, HBO, CANAL+ production, recently aired on Sky Atlantic and is available as a four-disc set on DVD, Blu-ray and digital release from 26 December. Dark, compelling and beautifully shot, THE YOUNG POPE is brilliant piece of experimental filmmaking by Paolo Sorrentino. The first episode (which is arguably the most visually striking and controversial episode of the entire series) aims to shock with its striking imagery and dialogue in which Lenny awakes from a dream to tell the audience to indulge in forbidden pleasures such as masturbation, gay marriage and a free and liberated lifestyle. Its controversial subject matter and striking visual iconography make it a challenging watch but if you stay with it, the series quickly pulls you in with its clever writing and unexpected turns. What makes THE YOUNG POPE so captivating to watch is the style and beauty in the filmmaking. Sorrentino is known for being a visionary and his work on THE YOUNG POPE is no exception. The series is beautifully shot with cinematographer Luca Bigazzi’s luscious visuals emphasising the surrealistic scenery and sumptuous sets. The intelligent script is equally captivating, keeping you constantly surprised and unsure of what is to come. The series takes an unconventional look at the Vatican, delving into the psychological state of the young pope as he reflects on faith and human nature. Subjects of religion, belief and devotion are treated with complexity, asking all the questions and giving no simple answers. Jude Law brings style and swagger to the role of Lenny Belardo, the cold and stoic pope who at times, struggles to find God and battles with his own conscience. Law handles the conflicts well, delivering a powerhouse performance as the right-wing, chain-smoking, deeply cynical and ultra-political pope, a complex character that you can’t quite figure out. Elsewhere, Silvio Orlando impresses as Secretary of State while Diane Keaton solidly depicts Sister Mary adding a much needed grounding presence. Yet, the elements that make THE YOUNG POPE so special (the script, the striking imagery, the controversial subject matter) is also what makes it a challenging drama to watch. This is an intelligent piece that requires your full attention. The dialogue is dark and ominous, the conversations are rapid and resolute and the subject matter is laced with controversy. Despite being a 10 episode long miniseries, a number of story arcs are also never fully explored or resolved. While there are some beautiful ideas and motives planted, they are cut down before they can blossom and the only thing that is made crystal clear is that the pope is conflicted. That said, this is dark, emotive and unpredictable drama that you can’t help but watch. The controversial subject matter and dark humour may not be to everyone’s taste, but it makes a refreshing change and is exceedingly well executed, acted and directed. THE YOUNG POPE is available on Blu Ray, DVD and Digital Release on 26 December 2016.